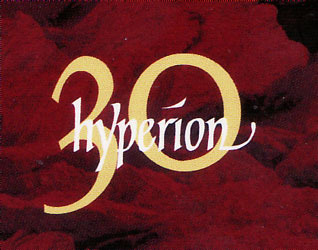 Congratulations to Hyperion Records on their 30th anniversary. We take this opportunty to bring to notice their special releases for the occasion and remind readers that we have reviewed many Hyperion discs over long years (in other outlets besides Musical Pointers too) and have come to rely on their high production values, so that re-issues on their label are almost always self-recommending. 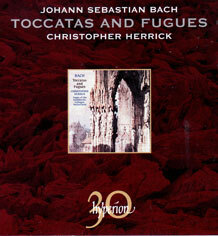 A famed recording from 20 years ago on a Metzler organ in Switzerland; a worthy choice for this anniversary collection. Full documentation and superb sound !! 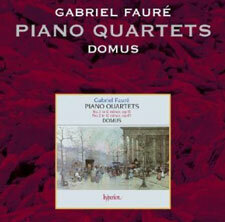 A renowned and well loved disc from the pre-cursor of the now famous Florestan Trio, recorded before Fauré's chamber music had achieved quite the reputation it presently enjoys. Read Susan Tomes (pianist of both groups) telling how it was travelling with a portable concert-hall! This disc won many awards, but some commentators find Domus "very bland" and prefer more impassioned and extrovert accounts of the quartets; this issue is dealt with fully in Roy Howat's The Art of French Piano Music, which we have reviewed. Recorded at London's Cadogan Hall following a concert we attended, this is a pleasing disc - a useful collection of mostly minor Mozart from his Salzburg days, with the popular Alleluia the most spectacular (from a time when church and opera were close) and the Agnus Dei from the Coronation Mass "a melody surely as near perfection as any he ever wrote" [Robert King]. Robert King will be directing his Consort with leading soloists in a major Bach concert (Lutheran masses) at Wigmore Hall, 1st October. Hamelin deplores the near disappearance of the composer/pianist, of whom Shostakovich and Shchedrin were two famous examples, the latter composer's inclusion prompting me to catch up with the disc, which I missd first time round. Shchedrin's 2nd Concerto is well worth getting to know, a very lively piece which roams amongst many idioms, including a look a dodecaphony (which he never fully embraced) and some "bop piano", all supported in great style and sonic splendour by the BBCSSO under Andrew Litton. See enthusiastic Amazon reviews (which I endorse) and the original cover image. 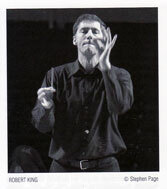 A great addition to the Hamelin discography and Hyperion's. 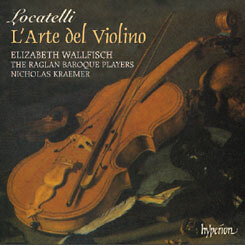 This is a great collection of virtuoso baroque violin playing, of music which was at the very cutting edge in the early 18th C, stretching technique to an unimagined limit, and in music of high intrinsic qualty. It gained high praise on original release (c.1994), when I had the pleasure of reviewing it in a long-lost paper-journal, and it retains its allure fresh as ever.The boxed set is available at various prices, worth looking around; a derisory £12 for the box of three discs from Presto Classical, but at up to £82 from Amazon (I guess they'll come into line shortly...)! This is an important recording worth searching for. The new pressings are dated P.2010. 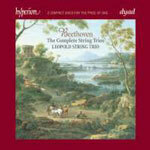 Sample one of the twelve concertos on YouTube. Perfect music to enjoy at mealtimes; we have played them over breakfast on several mornings. Alert performances, sometimes a little edgy (deliberately), by fine young players who are prominent on the UK scene in various groups; should be in everyone's collections alongside the quartets. 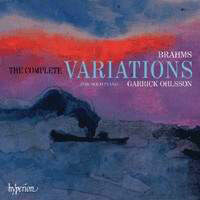 It is good to have all the Brahms variations brought together. Some are quite modest and accessible to "ordinary" pianists, even good amateurs; others are of notoriously fiendish difficulty. For listeners, however, "Variations" is an attractive form, easier to "follow" than are complex sonata movements. The virtue of this recording is that Ohlsson exudes the same confidence in the latter parts of the Handel Variations and the Pagannini set (which used to be thought almost unplayable except by Egon Petri and a very few others) so that one ceases to be amazed and just enjoys them as music. The recording (over four leisurely days in 2009, how sensible) is magnificent, perfect sonority from the outset with the rich transposition of the string sextet, a perfect opener.